If you’ve been using Mac for a long while, then over time, the number of installed applications could amount to up to 100. Most likely you don’t use all of them regularly, and some not at all. These programs take up space, not just in the Finder window, but in your hard drive. So it’s probably time to uninstall these apps with App Cleaner & Uninstaller. 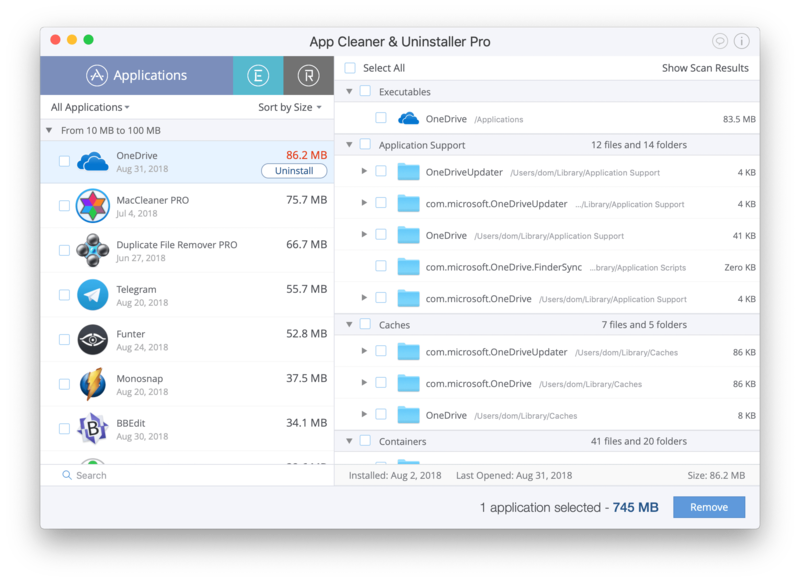 App Cleaner & Uninstaller is a professional utility to remove applications correctly and completely. You might know that when you simply move apps to the Trash, they leave their service files on the disk. So usually the users then go to the Library folder → Application Support and from there remove the app’s related items. However, with App Cleaner & Uninstaller you can save time and do all these necessary activities in just one click. The app finds all the service files of used apps and even the leftovers of already removed apps. On the screenshot, you can see the list of installed apps on the left and the program’s support items on the right. Here you will not find default Apple applications like Safari, Notes, Photos and others. Read on to understand why. If you have tried to uninstall Safari, Photos, Mail, iTunes or other standard macOS applications, you might have seen this error message about the impossibility of deleting these apps because it’s a requirement of macOS. It is prohibited to delete standard applications in the regular way due to the fact that the removal of built-in applications may damage the viability of the system. Although you can download Safari or iTunes from the official Apple website, other important programs are not available to be restored. Apple doesn’t allow you to delete its necessary apps. That’s why App Cleaner & Uninstaller doesn’t do it as well. This rule is extremely important for inexperienced users. However, if you are a computer geek and understand which default programs are safe to remove, you can do it via Terminal. How to uninstall default apps on Mac? Despite the warning, it is possible to remove unnecessary standard programs via Terminal. But first, you should know that with the release of macOS 10.12 Apple has made changes in its security technology System Integrity Protection (SIP) and it now forbids modifying system items on Macs. The SIP limits the actions that the user can perform on protected parts of the Mac operating system. That’s why, before trying to remove default apps, you would need to disable the Apple System Integrity Protection. To do this, restart your Mac and press Command+R key shortcut while the reboot is in progress. You will see an unusual startup window – this is the recovery mode. In the Menu bar click Utilities → Terminal. Press the Return key. You will see that your System Integrity Protection is disabled. Restart your Mac and move to the second step of the default apps removal process. You should login to your system through your admin account because you can remove default apps only if you have the administrator rights. However, if you have already signed into the user account, you can use a special command right in the Terminal to re-login. Let’s launch Terminal and learn the commands for each situation. 1. If you have signed into your administrator account, type the command cd /Applications/ and click the Return button. The application directory will be shown. After you have deleted the apps, don’t forget to enable back the System Integrity Protection in order to not remove other important apps by mistake. For this, again restart your Mac → use Command+R shortcut → open Terminal and this time type the command csrutil enable. Then restart the Mac. Once again, you should understand that uninstalling macOS built-in programs is at your own risk. And it may happen that the only way to reestablish an app and solve issues arising is to reinstall your macOS system (El Capitan, Sierra, etc.) Therefore, if you are not exactly sure what you are doing, it’s better not to attempt it! If you need to free up space, we recommend uninstalling only third-party applications. You can use App Cleaner for this task. Sort the apps by size and uninstall the biggest apps or those that have not been used for a long time.